Click on the thumbnail images or the hyperlinks to see more detail. Use the back button to return to this page. 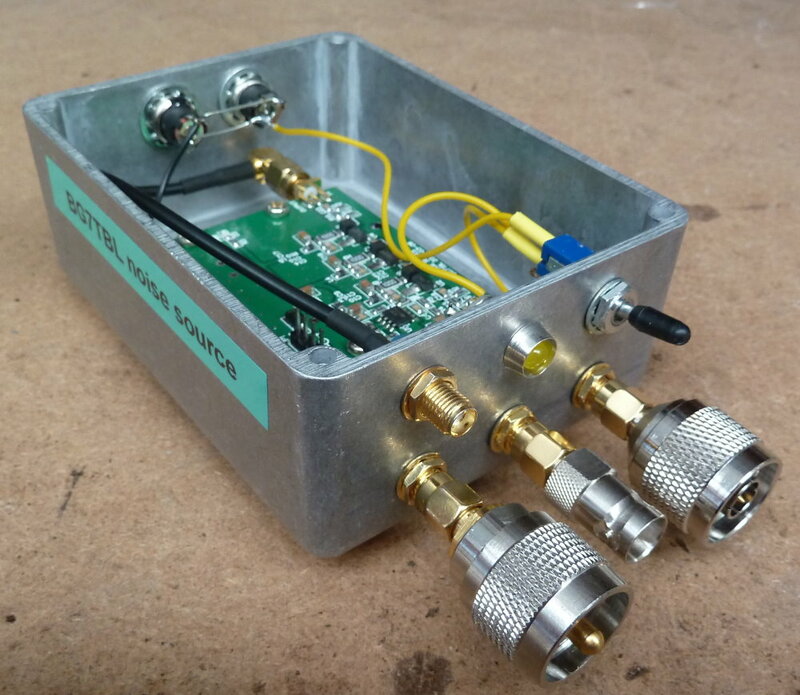 This project was inspired by an article in QEX May/June 2016 "Using a Wide-Band Noise Generator with a Spectrum Analyser". I have a old HP 141T Display with three Spectrum Analyser modules, an AN-8552B Spectrum Analyser IF section, an AN-8553B Analyser RF section and an AN-8554B Analyser RF section. There is no tracking generator with this setup and as I mostly use it to look at the response of low pass filters I needed something that could take the place of a tracking generator. This article was just what I needed. I purchased the BG7TBL noise source module on Ebay in December 2016 and it sat in the UFO (unfinished objects draw) in my Radio Shack until December 2017. 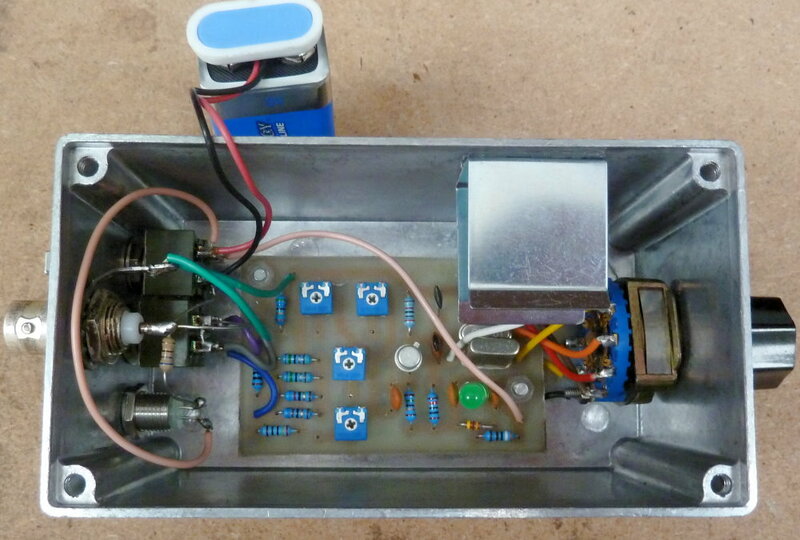 As I had bought two HF Low Pass Filters at the Adelaide Hills Amateur Radio Society Buy and Sell in November, I decided it was time to do some thing with the the BG7TBL module. A web search found a good review of the device at http://amateurtele.com that outlined its short comings but over all it gave it a good report. It took me some time to decide what connectors to use for the output and eventually come up with a solution, use three adaptors with the SMA connector supplied with the module via a short extension cable and attach the three adaptors to SMA connectors attached to the box. This way they are always there when I need them. An interesting Utube video is to be found here. 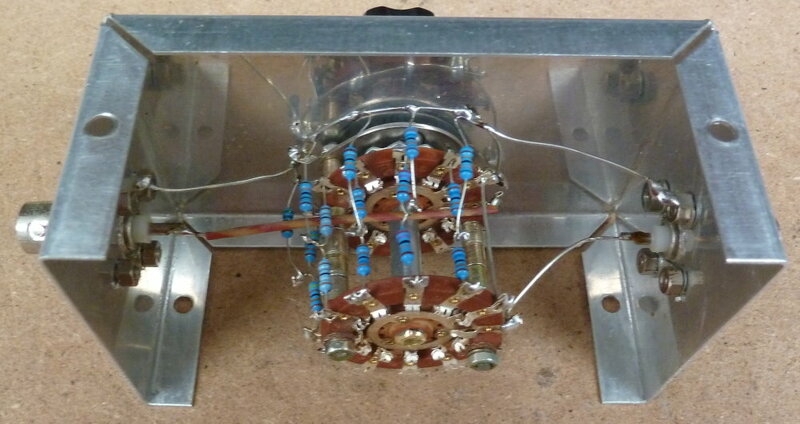 This project was made neccessary by the Wide Band Noise Generator project. That device put out too large a signal for the input of my Spec. Ann. 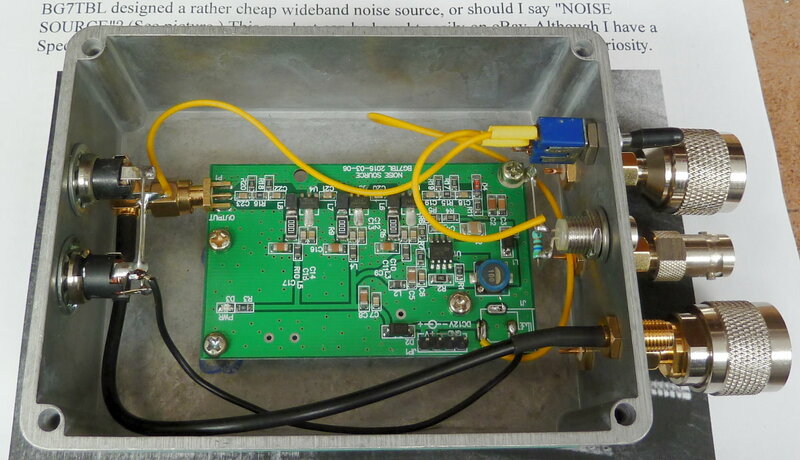 and so I needed a simple attenuator of either 10 or 20 dB. The best way to do this would have been to buy a set of BNC in-line attenuators I found on Ebay but I needed something to use today and the Ebay purchase would have taken perhaps four or more weeks. I will still buy these as they will have a far better higher HF performance than my cobbled together ones. Must have a look at how this little box performs one day with a friends fancy Spec. Ann. with tracking generator. The diagram below shows the format for the T attenuator pad format. 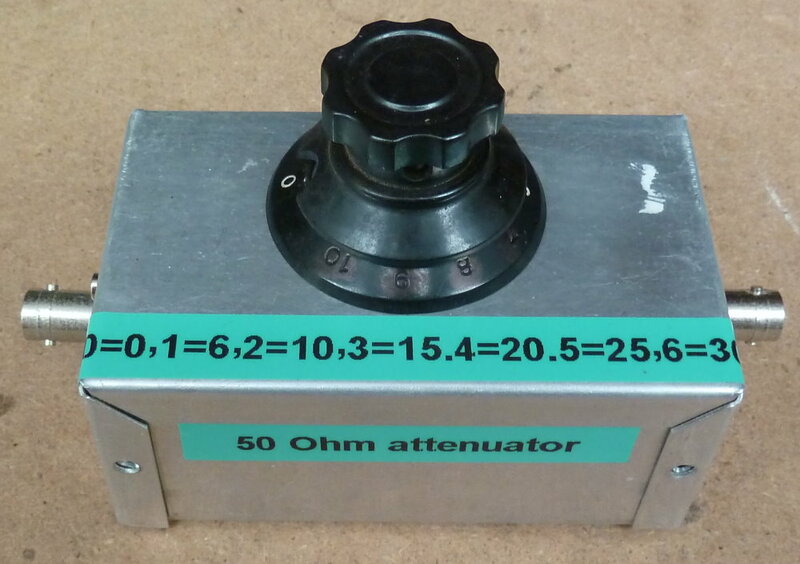 As the name implies, the T attenuator pad is in the form of a letter T with two resistors in series in the signal line and a single resistor to ground at the junction of the two series resistors. 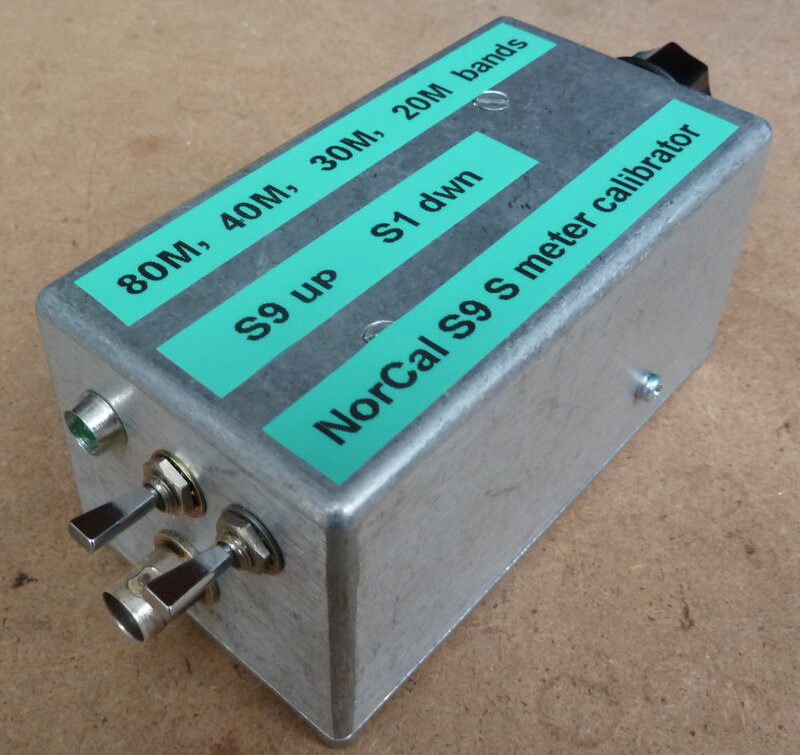 This was a project kit from the North California QRP Club in 2007 but it has not been available for many years. The original used all surface mount components and was housed in an Altoids tin, a popular project box in the USA for QRP and simple test equipment. The original instructions are here in PDF format. I contacted the NorCal Club and there were no plans to release any more kits and in fact it looked like the club was almost extinct. So it would be easy for older members of the local Radio Clubs to build this, I designed my circuit board using throught hole components and available hardware. My version is working fine for in the S9 position but I think there is too much leakage accross the attenuator for the S1 position to work at higher HF frequencies. I will look at another version where the attenuator is on a small SMD board of its own and see if this solves that problem.